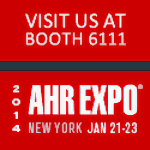 The 2014 AHR EXPO is world's largest HVACR event. This International Air-Conditioning, Heating, Refrigerating Exposition is being held at the Javits Convention Center in New York, NY, Jan 21-23 2014. These HVAC products are available in a wide variety of sizes and materials. Visit the our website for more information about our products, to request samples, or to purchase directly from our online webstore.